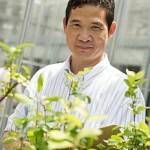 Kenong is our first expert contributor on plant genetics and genomics. He’s currently investigating the genetic and molecular mechanisms of economically important apple traits. Is Your Apple Orchard Robot Ready? While there are several challenges for widespread robotic implementation, improving apple tree canopies may help the transition to automation. How Did the Modern Apple Come About? Most cultivated crops, if not all, are domesticated from their wild relatives. There is no exception in the case of apple. Is CRISPR/Cas9 a Viable Solution for the Control of Crop Insect Pests? Gene editing has the potential to aid growers in control of invasive pests. We’re studying how genetics and branch growth can help prepare your orchard structure better for mechanization. In what has become a heated debate, let’s discuss the science behind GMO apples.